The Scaled Composites Model 339 SpaceShipTwo (SS2) is a suborbital, air-launched spaceplane designed for space tourism. It is under development as part of the Tier 1b program under contract to The Spaceship Company, a California-based company that is wholly owned by its sister company Virgin Galactic. 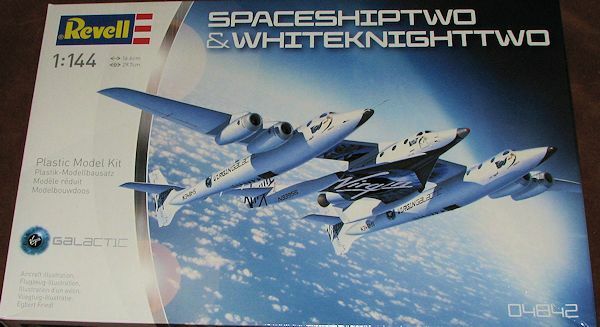 The Spaceship Company was formerly a joint venture between Virgin Galactic and Scaled Composites, but Virgin became the company's sole owner in 2012. SpaceShipTwo is carried to its launch altitude by a jet-powered mothership, the Scaled Composites White Knight Two, before being released to fly on into the upper atmosphere, powered by a rocket motor. It then glides back to Earth and performs a conventional runway landing. The spaceship was officially unveiled to the public on 7 December 2009 at the Mojave Air and Space Port in California. On 29 April 2013, after nearly three years of unpowered testing, the spacecraft successfully performed its first powered test flight. 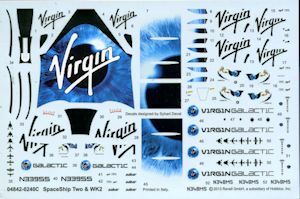 Virgin Galactic plans to operate a fleet of five SpaceShipTwo spaceplanes in a private passenger-carrying service, starting in 2014, and have been taking bookings for some time, with a suborbital flight carrying an initial ticket price of US$200,000. The spaceplane could also be used to carry scientific payloads for NASA and other organizations. Nice to see what is basically a standard mold kit of this combo and in a scale that will not overwhelm a display shelf. You basically get one large and two smaller white sprues with two clear sprues, The two clear and two smaller white sprues are the same. The kit has no interior, which is somewhat standard for the scale. There are, however, a lot of windows to put into both the mother ship and the space plane. You may want to paint the interior black. Each of the two fuselages of the mother ship will require 10 grams of weight to keep it from being a tail sitter. The kit can be built either gear up or gear down and comes with a nice display stand, something I think will get a lot of use. 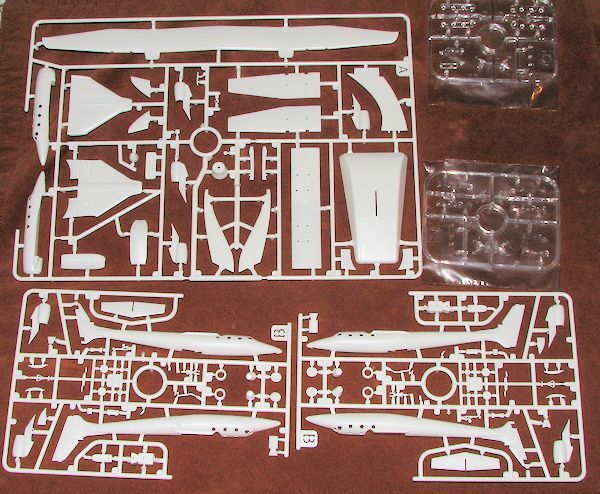 If you decide on gear down, you'll find nicely molded landing gear with separate wheels. For gear down, the gear doors will need to be cut apart. Each of the ngine pods consists of two main halves, a compressor face, a one-piece intake piece and a one-piece exhaust section. Instructions are the standard Revell AG type with lots of construction diagrams and paint references that only apply to Revell paints. Fortunately, this one is pretty much overall white with decals so no need to hunt up weird colors or mix paints. The decal sheet is quite comprehensive and looks great. If it is typical Revell AG, it will work just great. Those of us who like real space will be quite pleased with this one. Since it is basically an airplane, there should be a lot of crossovers. Judging by how quickly the LHS sold this one, it should be a brisk seller. Thanks to your editor for buying the preview kit.